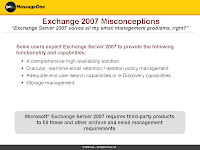 Lotus Evangelist: Fud Buster Friday #15 - Exchange 2007, What? You thought Clustering would Work this time? Fud Buster Friday #15 - Exchange 2007, What? You thought Clustering would Work this time? Continuing from my post yesterday, I listened to a call from CIO magazine about Risks and Mitigation Strategies for Exchange 2007. Professional courtesy, obvious interest for my benefit, but what I wasn't expecting was a complete sales pitch from Dell. I really wanted to know what does or doesn't work and how they get around it, it's the geek in me, probably should have realized this wasn't a CTO call. Well the good news is I did get some of that information. Bad news was I had to listen to the presenter, Samy Aboel-Nil, Director, Product Management for Dell MessageOne and it's co-founder, about why Dell is better equipped to handle the task of migrating, yes he used the word migrating, your infrastructure from 2000/2003 to 2007. To be fair he sounded a bit under the weather. Maybe some want to use Dell, but I am still bothered by the fact that if you have IT staff and don't trust them to do your work, then why have them at all? They are too busy? Why because the existing infrastructure has problems perhaps? It's not because of all the cool new functions they are rolling out in 85% of your companies. So the 1st graphic is about the idea that Exchange 2007 doesn't do everything although you might think that because of their FUD. Sure neither does Domino, but you know Microsoft has your customer convinced that Exchange can do it all. Granular real time retention? Interesting choice of words. And Exchange has a comprehensive high availability solution.Which leads me to graphic #2. Clustering in 3 flavors, none of which covers all bases and some of which is no better than previous versions. Cluster Continuous Replication still can not be done unless the servers are close to each other physically? And they want you to work off the Cloud with Azure? With what? A Mini Cloud outside your office or home? Still that's better than Standby Continuous Replication which will lose data and take 30 minutes to kick in! Amazing! Where do I sign up for such sloth like functionality? Lotus Domino servers fail over immediately and without the user knowing or caring it happens. Even across the US on 2 different platforms, Windows and AIX in our case, it just works and in seconds. And Microsoft boasts 30 minutes?!!!! Keith, your information is soooo good. Thanks ! Thanks Jack! It's comments like these which remind me why i do this. Yes, the information is excellent - thanks! Craig, Good luck finding the mini-Cloud, I just keep thinking of the Rolling Stones "get off of my cloud" song. Was your CIO on this call? No Session in Orlando? Now What? Proctor and Gamble Stole the Lotus Logo!